Readerly and writerly deportment counts for Keats, seemingly especially when he reads his “Presider.” They count for us, too, when we read Shakespeare. Our bodily and cognitive responses to Shakespeare on the page (more recently, on the screen) are part and parcel of what I call the psychosomatics of reading. Virginia Woolf either exulted or lamented that “every ounce of energy is used up” reading Shakespeare: “To throw ourselves this way and that with the emotions of the different speakers gives the illusion of violent physical exercise. . . . The vitality, the intensity, the compression and pressure of every page keep one on the stretch almost to the exclusion of comment.” When we read, or reread, the plays, do we recall a production, mark up the page, take notes, take a nap? In a three-page squib in her reading notebooks, Woolf mocks a reader who “wreaks his vengeance on the margin.” But in his duodecimo Whittingham edition of the Complete Works, Keats both jeered at and scrawled all over Dr. Johnson’s commentary. Fifteen years ago, I began looking for notable writers whose copies of Shakespeare’s works were both available to me for inspection and marked up with their notes, doodles, underlinings, and emendations. I assumed that they would have read with intensity, but sometimes, like the rest of us, they must have left evidence of their frustration or intimidation. Because such behavior speaks not just to scholars but to all Shakespeare readers, I set out to write case studies for educated readers like the ones who, on a frigid Sunday morning in New York, came to the 92nd Street Y to hear me talk about my book (curiously, a handful of psychiatrists among them). If first I had to find eminent writers whose Shakespeare reading stories I could tell, next I had to find my voice as an essayist not a scholar. After a professional lifetime of teaching students to argue, I set out to describe and to narrate. After years of attaining period expertise, I set my sights on the likes of Charles Olson and Allen Ginsberg. Having been something of a historicist, I began to focus on poetics. In the end, I marshaled everything I knew about Shakespeare, but I put it in the service of telling stories about how we read his works. Even though there are umpteen words devoted to how Shakespeare influences famous writers, we are not often asked to imagine ourselves standing over their shoulders as they read Shakespeare “in real time.” Think of Keats, with his friend John Hamilton Reynolds, schlepping “my folio Shakespeare” on one of their hikes on Hampstead Heath. According to Eileen Simpson, Berryman worked on his edition of King Lear in “a closet of a room, the Ball Room (named for Professor Ball, not a joke about its size), in the basement under Chancellor Green [part of Princeton’s pre-Firestone library], and reachable by way of a long, dark tunnel through which ran asbestos-covered hot-water pipes.” Melville, Dickinson, and Auden are among the Shakespeare readers whom scholars had already canvassed. Keats, Coleridge, and Berryman had also attracted attention, but I suspected that my reader-centered approach would produce a different harvest. And then there grew a long and disappointing list of writers whose copies of Shakespeare I could not locate or learned were unmarked: Karl Marx, Joseph Conrad, Mark Twain, Oscar Wilde, D. H. Lawrence, Frank Harris, H. D., Wyndham Lewis, Anne Sexton, among many others. I still have not gotten around to Graham Greene. As for Louis Zukofsky, his rebarbative heir prohibited me from quoting from or publishing any of his father’s extraordinary, extensive Shakespeare notes and marginalia. Like many of us, the writers in The Great William: Writers Reading Shakespeare grew up with assorted editions of the Complete Works. The words on the page have what Ginsberg calls mouth feel and the volumes have hand feel. We can take them down from our shelves whenever we like, travel with them, lend them; like Hughes, we can ink elaborate doodles in their margins; like Keats, we can deface them. The readerly experience that I call psychosomatic is not unique to hard copy, and it is hardly one that we have with Shakespeare alone, but it is one that Shakespeare makes different. To this difference, not just the seven writer-readers that I sample bear ample witness, but so do we. The Great William: Writers Reading Shakespeare was published by The University of Chicago Press (2016). 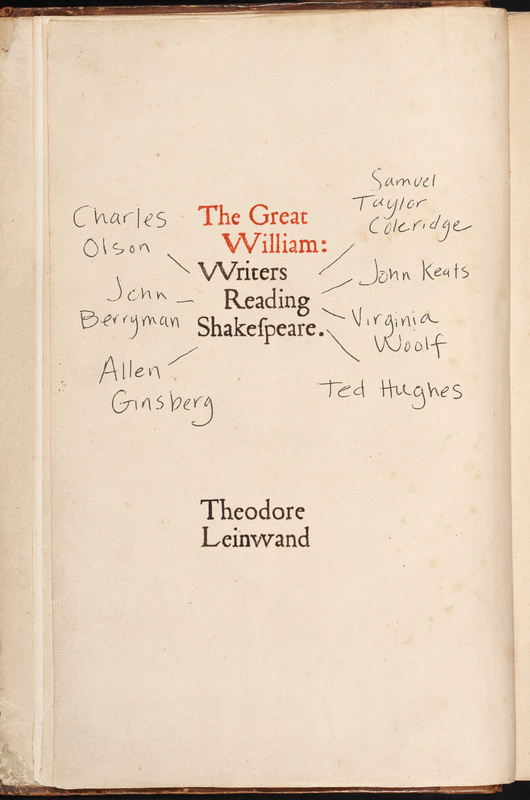 Theodore Leinwand, Professor Emeritus at the University of Maryland, is the author most recently of The Great William: Writers Reading Shakespeare (University of Chicago Press, 2016). 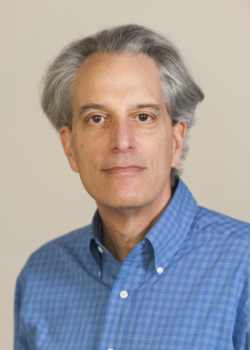 His essay, “Shakespearean Harmonics,” will appear in the winter issue of The Hopkins Review.